Arnold Schwarzenegger does motivational speaking tour of Australia; Tonight speaks at Sydney's Hordern Pavilion - 13th June 2013.. If you believe the media hype, it's been 33 years since Arnold Schwarzenegger last visited down under Australia and now he's back. The Hollywood icon has been a guest for motivational speaker Jamie McIntyre's 21st Century Financial Education Summits, and tonight an audience of about 500 enjoyed Arnie's talk at Sydney's Hordern Pavilion. Schwarzenegger talked to the audience about his experiences involving bodybuilding, investing, acting and politics. "Arnold embodies everything that the Financial Education Summit is all about," CEO of 21st Century Education, Jamie McIntyre said. "He is motivated, inspirational, an achiever against all odds." Schwarzenegger has not only made his mark as a renowned action hero and body builder- he has also served as the 38th Governor of California putting the state at the forefront of the nation in addressing the issue of climate change and taking action by signing the Global Warming Solutions Act of 2006, as well as establishing the Million Solar Roofs Plan. For the record, Schwarzenegger's talk was interesting, educational, entertaining, and did pass the credibility and substance test. Make no mistake - Schwarzenegger success in business and life is no mistake. He had a vision, a plan, learned, and put in the hard work. Special thank you to everyone involved in the success of the 21st Century Financial Education Summit, and a big thank you to the team at Markson Sparks! for helping make our coverage possible. 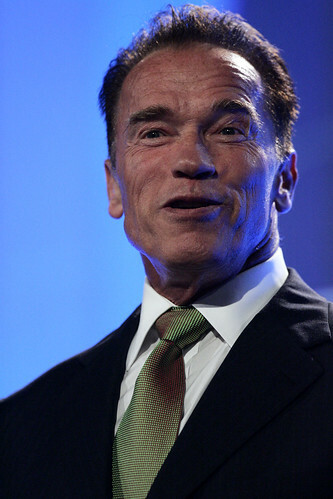 With a career spanning 46 years and reaching the higher echelons in sport, film and politics, Governor Schwarzenegger was the youngest person ever to win the Mr. Universe title before becoming the worlds most recognisable all American action hero in films that include; Last Action Hero, True Lies, End Of Days and the hugely popular Terminator trilogy. His movies have grossed over $3 billion. Governor Schwarzenegger’s most notable accomplishments in his first six years in office included the national-leading Global Warming Solutions Act of 2006 – a bipartisan agreement to combat global warming by reducing California’s greenhouse gas emissions – and overhauling the state’s workers’ compensation system – cutting costs by more than 35 percent. As Governor, Schwarzenegger has been California’s most effective marketing tool, travelling across the country and around the world promoting Californian-grown products, cutting edge technologies and the state’s diverse travel destinations. During his two terms in office, Governor Schwarzenegger worked to reform California’s fiscal policies, create a better business environment, reduce burdens on employment, boost exports and stimulate job growth. It was almost 20 years ago that Jamie found himself in an unenviable position. He was completely broke, in debt to the tune of $150,000, had no job prospects and was sleeping on a friend’s couch. Jamie grew up on a farm in rural New South Wales, Australia and from an early age had dreams of being successful, however he soon discovered that no part of his education had actually taught him the skills he needed to succeed. Jamie realised the world needed a 21st Century Modern day education rather than the current out-dated education system created in the industrialisation era of the 19th Century; A “21st Century” education that was better than school or university and taught by those with a PhD in Results, not just theory. An Education – For Life! Only 5 years from being almost bankrupt, he had succeeded – Jamie had become a self-made millionaire. This incredible turnaround can be credited to Jamie’s extensive research and to the knowledge he gained from his somewhat unconventional approach of modeling multi-millionaires, entrepreneurs, investors and success coaches.